Some people don't like tofu. I am not one of those people. 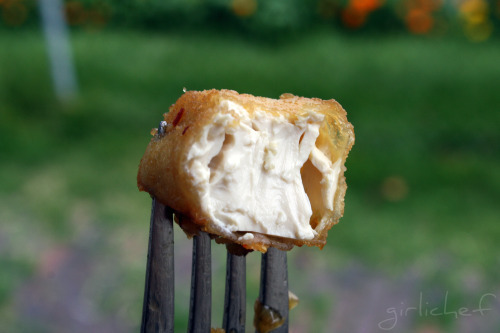 I like to put the soft variety into smoothies or whip it up into a dip...but my favorite, FAVORITE way of eating tofu is to fry it. It gets all chewy and delicious...okay, I find it irresistible. Call me crazy. Wouldn't be the the first time. The problem I've always had, though, is not being able to squeeze enough water out of the tofu to make it hold its shape. I mean, give me some cheese that needs pressing, and I pull out the dumbells...or the pans & heavy cans...but tofu...you see...it's a bit more delicate. I said I liked it pressed, not crumbled. Although I do like it crumbled. Just not when I'm going for pressed. Capisce? So, while I've given it the old college try...many a time...I'd somewhat given up resigned myself to the fact that I wasn't going to get my chewy squares of fried tofu. Not at home, anyway. Time rolls on. Cubes of chewy fried tofu remain the things of fantasy. Tofu smoothies. Crumbled attempts at stir-frys. Tasty tofu still finds its way into my mouth. And then, one day...just about a week ago...a magical little gadget ingratiates its way into my kitchen...into my life. Fast friends forever. I already have a pet name for him. TX (pron. Tex). You may have heard him called by the name TofuXpress. It would be an understatement to say he's changed my life forever. For the better. 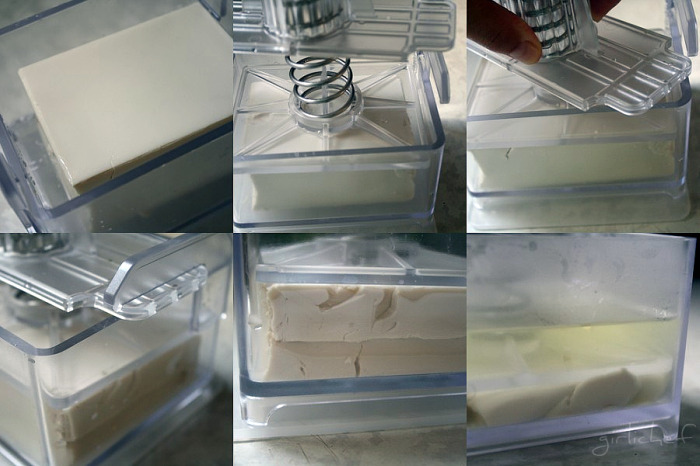 TofuXpress is a container with a spring-loaded "compressing" top that is exactly the right shape and size for an average block of tofu. The cool thing about it is that it can also be used to press the water from other foods such as frozen spinach, eggplant, tomatoes, cheese- you name it! But I'm guessing my little TX will be reserved exclusively for tofu pressing. As I said, easy as can be to use...simply center a block of tofu into the base of the TofuXpress, place the top over the tofu, press down while turning and slide the edges underneath the handle-like sides of the base. Place in the fridge and let sit for 1-3 hours (or overnight...I've tried that, too...totally rockin' chewiness is attained). Just look at the amount of water that is removed from the tofu!! Turn it upside down over the sink to drain the water, then remove the top and flip it over to remove the resulting tofu. The cool thing is, it also comes with a marinating lid, which you can use to cover the base if you want to store or marinate the tofu once it's been pressed. And then you can press it again after it's been marinated to get rid of excess moisture, if you choose. The lid snaps on right under the base for storage when it's not in use. Begin by cutting the pressed tofu into cubes. Pour some cornstarch in a bowl and toss in a few cubes of tofu at a time. Shake them around to coat, remove, set to the side and repeat until all tofu is lightly coated. Preheat about 2-3" of oil in pan to ~350-375 degrees F. Carefully lower the cubes into the hot oil, a few at a time, so as to not crowd the oil. Fry until the outsides turn golden. Remove with skimmer or slotted spoon to a paper towel-lined plate. In a large wok or deep nonstick skillet, heat a glug of olive oil. Add the garlic, ginger, scallions, and crushed red pepper flakes. Sauté until they begin to soften, just a couple of minutes. Drizzle in a little teriyaki sauce and a big blob of honey. Stir it all up over the heat and let it bubble up a bit to thicken. If it seems too thin, add a bit more honey. Once the sauce has thickened up enough to coat the back of a spoon, toss in the reserved tofu and the blanched broccoli. Toss everything around for a minute. Season with salt and pepper, if desired. Enjoy the chewy, fried tofu morsels with the green broccoli and the spicy-sweet sauce that envelopes them both like a your favorite blankie on a cold winters night. Would you just look at that!? Now THAT is what I was talking about. And now I can have it anytime I want! Please visit the TofuXpress website by clicking HERE...you can learn about the developer, the other uses, and even find some recipes! *I received the TofuXpress free from the company for review, but this in no way effected my opinion of this rockin' kitchen gadget! *Get Grillin’ with Family Fresh Cooking and Cookin’ Canuck, sponsored by Ile de France Cheese, Rösle, Emile Henry, Rouxbe and ManPans. Have you tried freezing tofu before you cook with it? it changes the texture of the tofu from smooshy to spongy. Most tofu that i eat at thai restaurants has been frozen first. i always freeze my tofu first because i love the texture change. check it out. This looks amazing. I love tofu too and I always hate squeezing the liquid out of it - you go through so many paper towels. I'll look into one of these for my pad thai! I agree with Miranda...frozen tofu ROCKS. But I definitely would LOVE to try this machine. There is nothing like fried tofu. Nothing. Don't you just love gadgets. Ellerinize sağlık.Çok leziz ve iştah açıcı görünüyor. That TofuEpress sounds amazing...and I do like tofu lots. Your dish looks pretty amazing too. Do you know I've never had tofu? Seriously. I need to get out more. This recipe looks good, I love broccoli. Tofu is on my "must try" list. Thanks for sharing! We like tofu too and your recipe looks wonderful! I like the idea of the press - I've only ever cooked with ready-to-cook tofu before but with something like that I might get brave and try the soaked kind! Sounds interesting that way. I do love fried tofu. Now if you can remember to tofu express it overnight you can remember to freeze it first :D ...just saying! I really need to try it both ways! Yay...just what I need...more gadgets! I love tofu and how it is a soft palate for soaking up flavors. This is one interesting product - thanks for the introduction. Finally - a kitchen gadget with a real use! What a neat little gadget! I love tofu but never cook it at home. I am tempted to give it a try now. That is some of the best looking tofu I've ever seen! your tofu looks so very good prepared this way, my girls would love it! where do I get that press! Cool new gadget! Bet you're going to get a lot of use out of it between the tofu and the cheesemaking!! I think I've only had tofu once, but never in a wonderful preparation like this recipe. I'm willing to bet that I would love it, especially since it's deep fried and has all the flavors I love! P.S. Love the transition from chopsticks to fork. (That's exactly what I would do)-LOL! haha, i just read your comment disclaimer, love it! i rarely eat tofu simply because my family won't go for it, but i really love the idea of that press. too cool, i'll have to check that out! Mmmmm, I don't really like tofu unless it's been squeezed. I'll have to check out the TofuXpress! Lucky girl to get to try this. I have seen it and wondered how it worked. Glad it passed with flying colors. 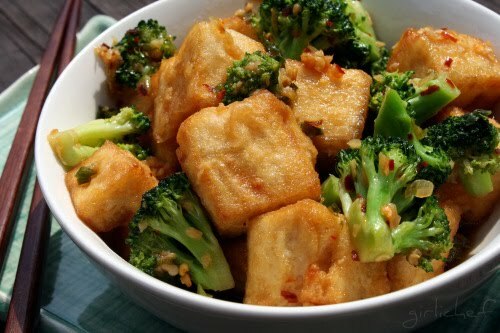 ;-) Your Broccoli Tofu looks delicious too! I don't eat tofu (soy allergy in the house) but dang you sure make it look goooooood! I actually really love tofu too, although my hubby usually needs to convincing to eat it :) This looks fabulous! I love love Tofu, unlike my husband. this dish is drooling. will make it for sure. Well that is a snazzy little gadget! I have never liked tofu. But to be fair, I haven't tried it in YEARS, and I was much less willing to give new things a try then. Your recipe looks so creamy and delicious I will indeed give tofu another go. I love tofu and this is on my must make list! Thank you for sharing! Normally I do not like tofu but I love it this way! Also try orange tofu. Amazing. Looks amazing along with the broccoli. Think this will need to be dinner tonight. This dish looks right up my alley!! 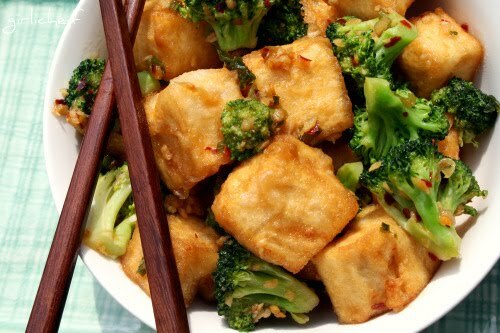 I've been making Chinese-style tofu and broccoli at home quite a bit and this looks even better!! Need to get me a tofu press. Thanks for linking this great recipe up at my blog hop!